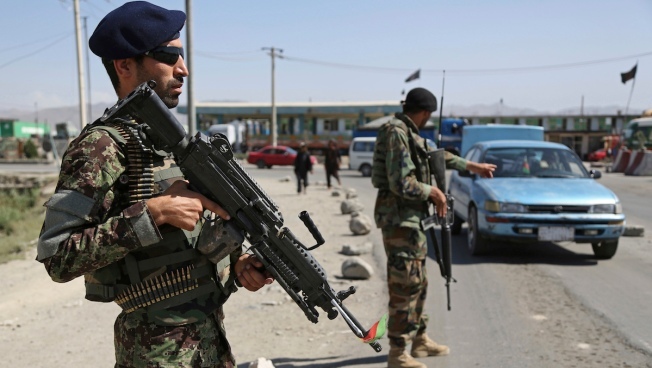 In this Tuesday, July 10, 2018, file photo, An Afghan national army soldier, right, stops a car for searching at a temporary checkpoint on the outskirts of Kabul, Afghanistan. It's too early to tell if training or other changes must be made in light of an insider attack in Afghanistan that killed one American soldier and wounded two others, because there's some uncertainty about whether the assailant was a disgruntled Afghan soldier or an insurgent infiltrator, the Army's top officer says. That's a reminder of the challenges facing U.S. forces in Afghanistan in the 17th year of America's military involvement there. The Trump administration is trying to boost the capabilities of Afghan security forces and increase military pressure on the Taliban in the hope of forcing them to negotiate a peace. Under the plan, the Army will build six brigades over the next several years. And Milley said Friday that the second brigade is currently doing pre-mission training to replace Jackson's unit when it's time for them to come home.